On a warm September evening in Columbus, Ohio, panicked witnesses called police to report that a group of boys had robbed a man at gunpoint and fled into a maze of alleys and fences on the city’s east side. In the fading light, Officer Bryan Mason cornered two of the boys in an alley, where, according to police, 13-year-old Tyre King pulled a gun from his waistband. 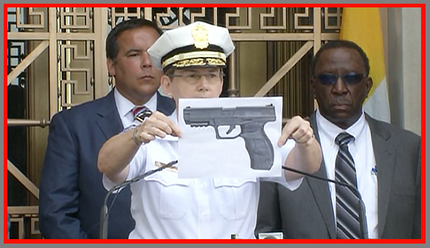 Mason fired three rounds, striking the teen in the head, chest and torso. Experts who study the domestic market for pellet and Airsoft guns said consumer demand for replica firearms has grown. “They are red hot,” said Tom Gaylord, an industry consultant who runs a popular blog for the Ohio-based Pyramyd Air, one of the largest air gun retailers in the country. Pyramyd Air declined to comment. The BB gun recovered was made by Umarex USA, one of the largest air gun and firearm manufacturers in the world and the self-proclaimed “king of replicas.” Umarex makes air guns under the Beretta, Colt, Smith & Wesson, HK, Ruger and Browning brands. It sells BB guns that are copies of such firearms as the iconic Colt Peacemaker, which was first produced in the 1870s, and the Heckler & Koch MP5 submachine, a mainstay of specialized military and police units. The Umarex 40XP BB gun that King allegedly brandished sells for about $50 in stores, including Walmart. Gunmaker Sig Sauer makes air guns that are advertised as “carbon copies” of their most popular lethal firearms, including the P226 semiautomatic handgun. A commercial on the Sig Sauer website displayed the BB gun and the lethal P226 as reflections of each other in a mirror. The claim was they are used for training. Gun rights groups, including Gun Owners of America, based in Virginia, have lobbied against laws that seek to alter air guns to make them distinguishable from firearms. The NRA declined to comment. In the 1980s, a string of police shootings of children prompted Congress to pass the first and only federal regulations on toy guns. Parents began to push manufacturers to make the guns appear less realistic. Retailers such as Toys ‘R’ Us stopped carrying realistic toy guns, and toy manufacturers began adding an orange plug to toy guns. After several states restricted the use of imitation firearms, Congress in 1988 passed a law requiring the bright orange barrel plug on all toy guns. The law applied to water guns, many replicas and Airsoft guns that fire nonmetallic projectiles, but it exempted BB, pellet guns and replicas of antique firearms. The law also mandated two studies on whether the new orange tips would prevent shootings. “No child should ever die because a police officer or anyone else mistakes a toy gun for a real weapon,” Boxer said in a news release at the time. The bill stalled in committee.